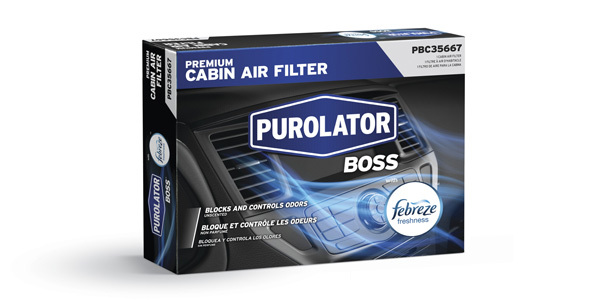 Purolator announced it has partnered with Procter & Gamble’s Febreze brand to produce premium cabin air filters in North America. PurolatorBOSS premium cabin air filters with Febreze freshness hit the market in November. Purolator will showcase the new filters in booth No. 1432 at AAPEX 2018 in Las Vegas. “Purolator’s filtration expertise coupled with Febreze, the leading brand in odor elimination, has resulted in a premium cabin air filter that provides fresh, clean air inside the vehicle while blocking harmful airborne contaminants that cause irritation, allergies and illness,“ the company said in a news release. This advanced filtration product provides the odor-eliminating technology of Febreze with an antimicrobial layer that prevents mold, mildew and bacteria growth. The highly efficient filter media blocks fine dust particles such as dirt, brake dust, soot and allergens – while optimizing critical air flow through the vehicle’s HVAC system, allowing it to function properly, according to the company. For more information about PurolatorBOSS premium cabin air filters with Febreze freshness, visit booth No. 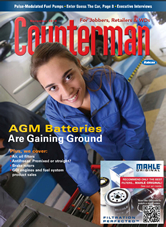 1432 at AAPEX or contact your Purolator sales representative. To learn more, visit www.pureoil.com.